MINNEAPOLIS � Jan. 17, 2013 � Cargill has announced that its Truvia® sweetener brand, with natural sweetness from the stevia leaf, has renewed its role as the Presenting Sponsor of the American Nurse Practitioner (ANP) Foundation's “Simply Health In Practice ” (SHIP) initiative. SHIP is focused on providing healthy living resources for nurse practitioners and their patients. The SHIP website, found at http://anp-foundation.org/programs/simply-health-in-practice/, provides nurse practitioners with tools, tips and ideas to help effect positive change for their own wellness and for the health of their patients. Truvia® sweetener, America's number one zero-calorie natural sweetness solution, is available to consumers in a number of forms � sachets, a spoonable jar and a baking blend. Truvia® sweetener, America's number one zero-calorie natural sweetness solution, is available to consumers in a number of forms � sachets, a spoonable jar and a baking blend. It also is an ingredient in a growing number of foods and beverages, such as Glaceau's vitaminwater zero™ and Hansen's Natural drink stix. The Truvia® sweetener team manages a comprehensive healthcare professional outreach program to support product growth for food and beverage customers, who include the Truvia® brand on their packaging. 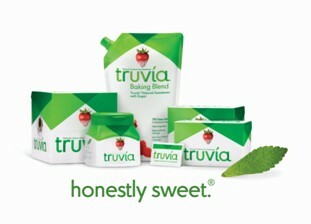 For additional information about Truvia® sweetener and all the products that contain it, visit www.truvia.com. About CargillCargill is an international producer and marketer of food, agricultural, financial and industrial products and services. Founded in 1865, the privately held company employs 142,000 people in 65 countries. Cargill helps customers succeed through collaboration and innovation, and is committed to applying its global knowledge and experience to help meet economic, environmental and social challenges wherever it does business. For more information, visit Cargill.com and its news center. Truvia® natural sweetener is a great tasting, zero-calorie sweetener made with the best tasting part of the stevia leaf. Truvia® natural sweetener is #1 in its category of zero-calorie natural sweeteners in the U.S. and is also available to consumers in Europe and Latin America. Truvia® stevia leaf extract is also a versatile sweetening ingredient used to reduce calories and sugar in foods and beverages. The Truvia® business uniquely manages its stevia supply chain from Field to Table, having established a global agricultural standard for stevia. For more information, visit www.truvia.com.